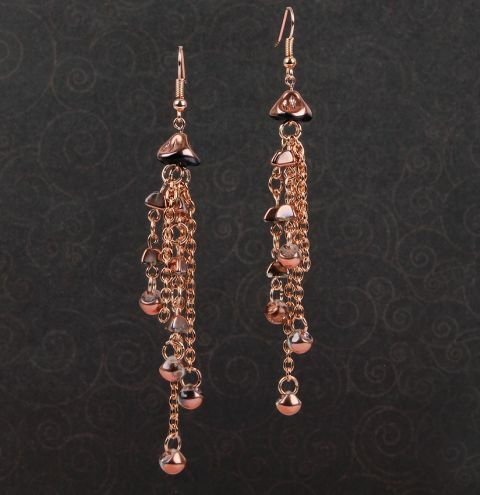 *SALE MAKE* Create two pairs of earrings using a mix of Preciosa shaped beads and chain for a textured and metallic look! Find more bead colours on sale at The Biggest Clearance Ever! Thread an eyepin through the petal bead and turn a loop at the top. Connect this loop to an eyepin. Thread a triangle bead onto an eyepin, bend the end, trim it and turn a loop. Make four more. Link three of the looped triangle beads together with jumprings in between and on the last loop attach a mushroom bead to a jumpring and link it to the end. Attach the piece you just made to a jumpring. Cut a 4-inch piece of chain, find the link at the 1.5-inch mark and link this onto the jumpring. Attach a mushroom bead to each end as before. Attach this jumpring to the eyepin loop inside the petal bead. Make another chain of 2 triangle beads with a mushroom bead at the end and link it to a new jumpring. Cut a 2-inch piece of chain and connect the link around 1/4-inch mark to the jumpring. Attach the jumpring to the loop inside the petal bead. Repeat these steps to make the second earring.